Please Join Us for #GivingTuesday or Colorado Gives Day! First Nations Development Institute is participating in two separate giving campaigns in the next couple of weeks. We would be delighted if you would join us by making a donation to First Nations during the nationwide #GivingTuesday campaign on November 28, or a week later during Colorado Gives Day on December 5. First Nations is an organization based in Colorado but which serves Native communities, nonprofits and tribes throughout the U.S., so it makes sense for us to participate in both events. In both cases, anyone anywhere can donate on those days. For #GivingTuesday, donors can simply visit the First Nations donation webpage here. #GivingTuesday is a global day of giving fueled by the power of social media and collaboration. Celebrated on the Tuesday following Thanksgiving (in the U.S.) and the widely recognized shopping events Black Friday and Cyber Monday, #GivingTuesday kicks off the charitable season, when many focus on their holiday and end-of-year giving. 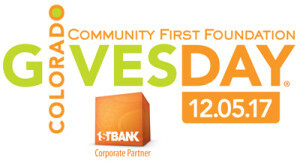 For Colorado Gives Day, donations are processed through ColoradoGives.org and gifts to First Nations can be made at this link. You can “schedule” your donation ahead of time and it will be “delivered” on December 5. Colorado Gives Day is an annual statewide movement to celebrate and increase philanthropy in Colorado through online giving (but you don’t have to be in or from Colorado to give). Presented by Community First Foundation and FirstBank, Colorado Gives Day is powered by ColoradoGives.org. This year it features a $1 million Incentive Fund. Every nonprofit receiving a donation on Colorado Gives Day will receive a portion of the fund, increasing the value of every dollar donated. Colorado Gives Day has grown to be the state’s largest one-day online giving event, raising more than $200 million since it began in 2010.